Bicycles are used for exercising, moving from place to place and having fun with other users. For a great cycling experience, you need to purchase a quality bicycle. If you are serious about getting a road bike where you are going to be riding for a long period of time, then you need to choose the best road bikes under 500 dollars that suits you. In fact, a good bicycle should be made under the required standards for your safety and comfort. It should be based on the materials, component, sturdy, comfortable and responsive to meet your cycling needs. You first have to understand that finding a bike that suits your needs is very crucial if you want your ride to be as enjoyable and as comfortable as possible. The following are some few tips to consider when choosing your road bike. 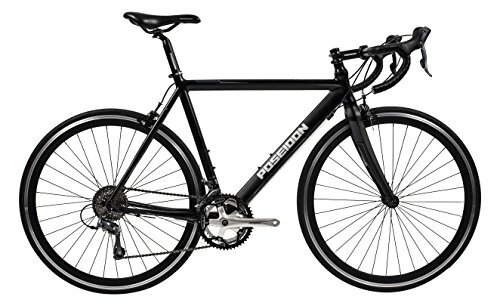 In your short time to give you a heads up, here are some of the best road bikes under 500 dollars that you could get. The Vilano shadow road bike with Shimano STI integrated shifters could be one of the best bikes to have. If you are in love with riding, then you could never go wrong with having this bike due to its efficiency and high performance. What is interesting about this bike is that its brake system is well designed and quite easy to control and unlike any other bike, you won’t have to spend a lot of money ensuring that it is in good condition since it rarely fails. This bike is just perfect for beginners since it is easily adjustable. The body construction of this bike is perfect with 6061 double butted aluminum aero frame that makes it light which makes lifting it quite simple whenever need be. If you are a traveling person and would like to carry your bike on the bus, train or vehicle then this is the best bike to have. While choosing the good bike is very important, this bike comes with the perfect measurements to fit with normal size person. It comes in three sizes small size is 50cm, medium size 54cm and the large size 58 cm which widens your options. It has a speed of 14 which is just perfect for most riders. However, if you need a greater speed, then this could not be the best option for you. The wheels of this bike are constructed perfectly with 700c double-walled CNC alloy machine sides plus its CST 700c by 25c tires which makes it work efficiently on any terrain; this makes it perfect if you are a rider in love with adventure rides. The Merax Finiss aluminum road bike is among the best bikes that work perfectly well regardless of whether you are a beginner or just interested in making your riding experience more fun. It has some of the best features that any ride lover could wish for on his bike. Being constructed with a lightweight and a Sturdy 6061 Aluminum Frame, it provides smooth riding and easy transport. Despite having a lightweight, it can withstand riders with up to 330 pounds, which is why it is the best bike for anyone getting serious with riding. The design of this bike is made quite perfect with Shimano shifter and Shimano derailleur which provides very reliable shifting whenever you need to. This bike comes in three sizes which are suitable for anyone: 50cm, 54cm, and 58 cm. The measurements represent the distance between the center of the bottom bracket up to the top seat tube fixed to the seat clamp. Its speed of up to 21 is just perfect for fast riders plus it comes with a quick release front wheels which are easy to install since no extra tools are needed, this is very important for the efficient and maximum performance of the comfortable bike. What is even interesting about this bike is that it has an aluminum kickstand that has lightweight which reduces the weight of the bike and the fact that it uses Kenda tires makes it perfect for racing persons. With a blend of some of the best features that any good bike could have, this bike is worth the money since it adds flavor to your riding experience. 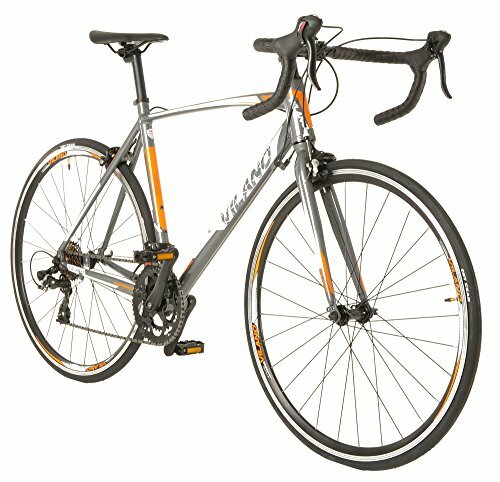 Giordano Libero 1.6 men’s road bike could be one of the best bikes to kick off your entry level if you don’t want to spend much but get a good beginner bike. If you are not sure on which bike to take on your next trip, then this bike could perfectly fit you. This bike comes with quite a reasonable price as compared with the great features that it has, which makes it quite affordable and a good quality bike that most riders could easily afford to have. 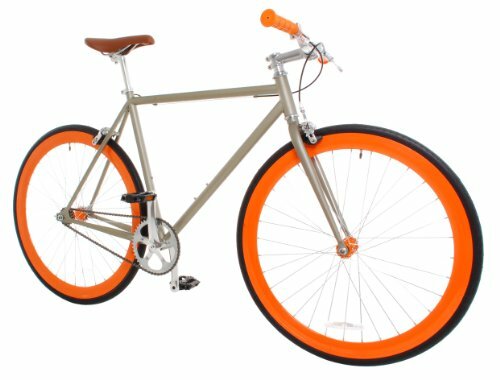 This bike is very attractive with excellent design, and it has an incredibly lightweight that comprises a handcrafted 6061 aluminum frame that is designed to last long. This feature makes it reliable since you don’t want to spend a lot of money maintaining your bike. The brakes and shifters of this bike are designed to work perfectly well. However, the brakes are not quite precise, and you may experience some difficulty in shifting. Its 16-speed Shimano Claris STI shifters are just perfect plus they are simple to use since they are flexible and shifts with great ease. Alongside its 32 spoke high profile quick release alloy rims make it among the best bikes that come with an affordable price. The derailleurs of this bike are constructed to work perfectly and having a high-quality handlebar tape gives it a competitive advantage when compared with other bikes. These bikes come in three sizes which widens your options to choose from hence you can never miss one that perfectly meets your specifications or your size. The fact that it comes with dual water bottle slots makes carrying water on your rides quite easy. This bike is a perfect option for those individuals who are starting out the cycling activities since it’s easy to handle because it has a lightweight, it weighs around 24 lbs. The bike has also gained popularity as well again due to being fast, efficient and it has narrow high-pressure tires which make it an excellent bike for reaching various speeds. Bikers usually use the Vilano road bike to do fitness activities, commuting to and from work and touring around during leisure periods. The bike may also be used by racers for competition purposes during group rides during organized tournaments. This bike’s ability to shift easily gives it the ability to handle hills, flat areas and everything in between. Every rider who needs to make a purchase first puts into consideration the ability of the bike to navigate to the different place without the bike getting disrupted by conditions such as floppy areas and poor roads. When the road is rough and the bike is not designed to cope with such conditions it can be a bit tricky because the racer will end up losing touch and thus discrediting the ability of the bike they are using. The best way to choose a bike is to consider the level of expertise you have since it would not be such a good idea for an expert to choose this kind of a bike since it is designed to simply serve a purpose of being a helper simply! The 21-speed bike is a great recommendation though especially if you are new to the racing experience. This bike has gained popularity in the recent past because of its availability in different sizes in a frame that fits both gender parties i.e. men and women. For a complete beginner, this bike is recommended for them since it has a smooth gear system and offers cool riding thus covering longer miles with less effort application. The entry level bike also has some other key features which include the adjustable handle and the cassette rear wheel which both improve its efficiency. 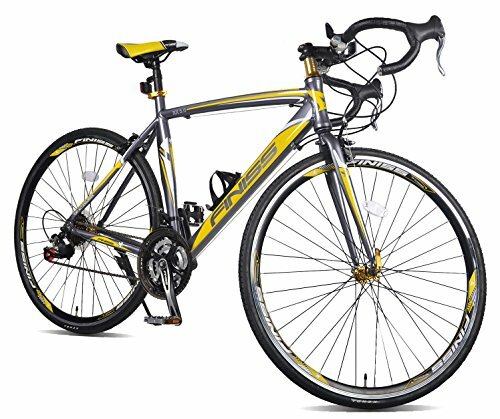 Many racers would, of course, opt to buy this bike due to the fact that its prices are a bit low and it offers an amazing riding experience for the racers who have promised to purchase the product. P.S. Don’t forget to check out our guide on the best entry level mountain bikes. The most interesting part about racers is that they normally want an exceptional experience when it comes to having a ride, in the sense that once the gear system is smooth the experience going to be different. And that will make the existing users come to realize and subscribe to the loop of coming again and again since every customer wants a deal for them to associate themselves with the kind of products being offered. For example, the smooth gear system is normally a preferable choice over the single gear system because the single gear tends to require more energy from the racer during the cycling activity. For couples, this bike wouldn’t be a bad idea though since it exists in different sizes. This single speed road bike is one of its kind in the sense that it allows one to choose how they want to ride it. Since it has no gears, which means that there will be easy maintenance. The Vilano Rampage is also very light and it is around 22Ibs leaving alone the amazing styles that capture the people’s eyes around it. The deep V wheels also make it a better grip on the road and the bike. Typically, this bike is mostly used by weekend warriors, commuters and students since they mostly need to mobilize themselves to those respective locations on time. This product though appears to be a contrary option for some of the individuals who argue that the bike serves short distance races or simply fitness purposes but things like covering extreme distances the Vilano Rampage can be a bit challenging in that you can’t switch between modes during the cycling processes of training and activities. The last good thing about the bike is that it gives moments its best especially when people opt to ride in groups and remain at the same pace during the rides, the Vilano delivers typically perfectly. If I were to compare this single speed bike with the smooth gear bike, I would definitely go for this one since it really gives the impression of like m having an original ride with the system switched to the mode where the user propels the bike initially all along. 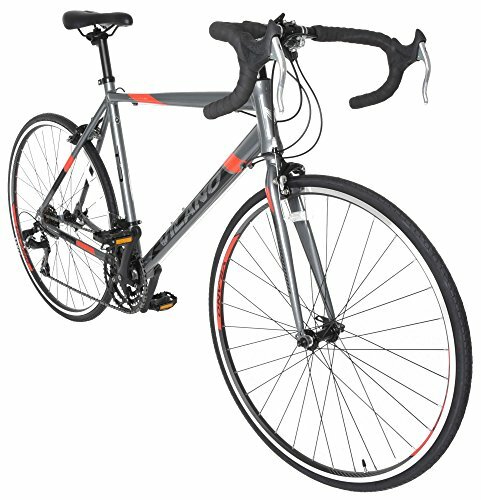 $500 road bikes are a great budget option for anyone whether you’re a beginner or an experienced veteran. There are different types of road bikes. Most road bikes are good for commuting and speed, but they are a bit expensive than other types of bikes. But you need to decide on the quality of the bike. If you intend to be biking every day, invest in a high-quality bike. High-quality bikes last longer and are made of lightweight, durable materials. This makes cycling enjoyable and fun. Also, if are planning to mount some accessories, make sure the frame of the bike is compatible. Road bikes have shifters and gears that are operated by a trigger. Bikes with complex gears are a bit expensive than ordinary road bikes but enable you to peddle comfortable even on hills, rough grounds and also on a windy day. For you to enjoy biking, you need some skills and a lot of practice. But by understanding the type of terrain you will be biking on, you will be able to pick the best entry level bike for you. Bike comfort goes beyond the seat. It usually depends on where you will cycling and the average commuting time. All bikers want a bike that makes them feel relaxed and in control. Most road bikes are designed to ride on flat terrain and roads. They have drop handlebars to allow different postures and hand positions. They also have different gears to help you encounter strong winds and on hills. If you may be spending many hours on your road bike, check all the accessories to ensure you remain comfortable for that long time. The fit of the road bike is essential because various bikes have different heights and lengths, for different body types. Ensure you can reach the handlebars well without bending too much. When riding, you should be able to keep the head up without straining your neck. The seat and frame size can also affect your comfort. 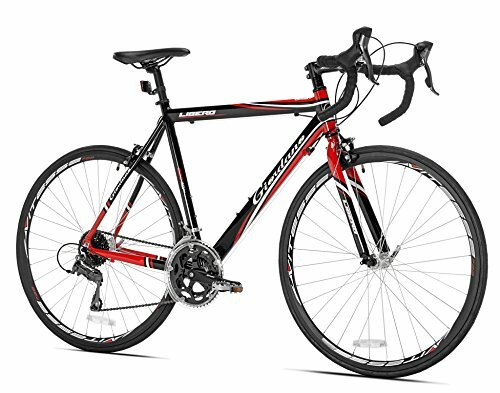 Choose the best road bike that you can adjust the seat well and one that is gentle on your knees. Check the size of the wheels as well. Large wheels might be useful for speed but might be large for your body. One of the main reasons that prevent people from taking up cycling is the cost as you may know most good bicycles can easily cost thousands of dollars. However, it is not very difficult to find great deals on the internet or from warehouse stock clearance deals. If you are diligent enough to do thorough research and do not jump on the first deal you come across; then you are very likely to be able to get better deals. First, you need to know how much you are willing to pay for the bike. Next, you will have to determine where you will be spending most of your time riding the bike at If you enjoy riding through mountain trails, then you can get a mountain bike. But if you are riding on the road then you need a road bike. The next point you need to do is to test the size of the bike. You will have to measure your own inseam and then based on that measurement, you can determine the correct bike size for you. Different types of bicycles will usually have a different way of calculating the size. Deciding on the right bike can be intimidating for the beginner as there are literally hundreds of different types and sizes available. Be sure to try out as many as you can and to take your time doing thorough research. Be sure to decide ahead of time where you will be riding and how much you intend to spend. Finally, after you have decided on the size you need, then the final step is a test ride the bike. Only pay when you are totally satisfied with it. Good luck with finding the perfect bike for yourself! After comparing the features that these inexpensive road bikes come with alongside their performance, Merax Finiss aluminum bike earns its way to the top of my list. This bike comes with a blend of some of the best features; this bike performs perfectly when on and off the road. Its price is quite reasonable since it has tons of good features that any rider would need. However, when you are out shopping for a bike make sure you choose one that best suits your needs, for instance having one that might not be of the desired size or speed could ruin your riding experience. The bicycle now does not appear just as a two-wheeled, the steerable machine propelled by its rider but it has got to be one of the cleverest and cunning devices that we humans have ever invented back then. In the past, it was usually used to transport and probably commute, but nowadays things have changed and guys are making tremendous steps in developing new features for riders so that they can make their riding lives more exciting and perfect at the same time.